Wednesday was my birthday so I had the grand idea I would hit the Greenwich Beer Festival on its first day to catch everything fresh. It took me forever to get there, as the Docklands Light Railway was severely delayed. When I got there it wasn’t very busy, it being a weekday afternoon. 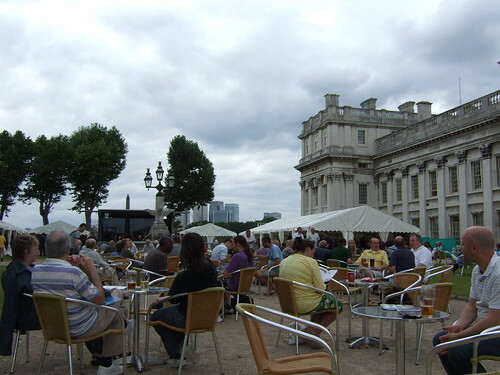 It was on the gorgeous grounds of the Royal Naval College and there was plenty of space to lounge in the grass and there were even chairs and tables available– that’s how uncrowded it was. The James Evans Giraffe band was on stage doing a kind of Rutles version of New Orleans’ Professor Longhair’s Tipitina. I admit nothing scares me like white-baby-boomer-property-ladder-blues/jazz. (You know, music for the chaps who buy Ron Wood’s paintings for their second homes in the South of France). I was happy that this band dispelled my dread– no bids at authenticity here, just eccentric interpretations. Beer-wise, I started off with something I thought I knew– Twickenham’s Sundancer. It was pleasant enough for looking over the tasting notes and planning the next few hours of drinking, but it wasn’t the beer I thought it was. Perhaps I had it confused with Sunchaser? Or maybe it was just that subtle difference between casks and contexts. I looked longingly at the cider line up but knew that it would get me drunk too fast and ruin my palate. I decided I would start with the lighter, hoppier beers and move to stouts. I planned to end on Meantime’s London Porter, having never tried it. I knew I could get it at Waitrose and it would be the same, as it’s not in a cask, but I thought it would be appropriate, being that I was in Greenwich and all that. I never got to try it but I will explain later. Mr. Malting had a mild masterplan– he was going to try them all. His favourite was the Woodforde’s Mardler’s Mild. I started with Oakleaf’s Hole Hearted, which was lovely– peppery, floral and refreshing. Next was West Berkshire’s Dr. Hexters– I’ve like all the beers I’ve tried with them. It was drinkable but would have been better complimented with food rather than by itself. Then I went dark– Burton Bridge’s Bramble Stout. Complex and dry juxtaposed against a very sweet nose. I wrote down that cheese & Branston pickle would have gone well with it. I must have been hungry. I particularly liked the copper tang in the middle. Then followed Nelson’s Blood. I was almost put off by the vegetal stink. It was the first day of the festival– how could it have gone off already? It tasted ok but was hard to get through. Disappointment continued to the Milestone Black Pearl– described as an Irish stout, it had the thinest mouthfeel of any Irish stout I’ve ever tasted. The “burnt toast” description in the tasting notes was more like burnt brisket. Mr. Malting tasted it and we both agreed that the swamp gas aspect couldn’t be gotten past. I poured it out. My next move was to the Exmoor Beast. It was lovely but I made no tasting notes. As I was drinking I noticed everyone was ordering full pints, many people going back for the same thing over and over. I didn’t see many tickers here at all. Was I the only one taking notes? I wondered how they really managed this– pint after pint after pint. This is not a new revelation though–I’m still in England, where people can put away six pints in a session. But, you know, sometimes they can’t. I noted an table of old men near me who had been drinking round after round all afternoon. One completely hairless geezer with the leather skin and upmarket casuals of someone who winters in Spain, stood suddenly and countless pints coursed out of him. With zen calm he reached into his mouth in mid-spew to pull out his false teeth. Everyone, including his mates, sat around drinking and eating as if this were not going on right next to them. (Brits are very down on anti-social youth but to be honest much of the bad drinking-related behavior I’ve witnessed has come from men old enough to know better.) I never in my life thought I would say this but you know, shame has its uses. Sometimes shame is good. Yep, It was time to make the two hour trek home. A year ago my good friends Edie and Bob were visiting and we decided to drive around Wiltshire seeing the sights, when we took a wrong turn and ended up in a small village called Seend. On one post was a magic marker sign, like some secret doorway to a malty dimension: BEER FESTIVAL. We followed the arrow, gleeful at our luck, and ended up at the community centre where a trad band was playing and over 30 kegs of local microbrews were mounting on scaffolding waiting for us. I should explain here that Bob, brewer extraordinaire, is the person that taught me how to love beer. 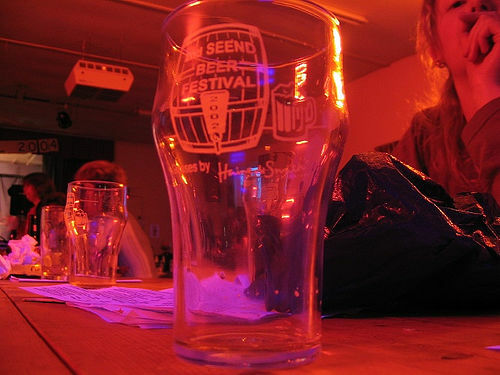 We’d been to many countries tasting different beers but the Seend beer fest was by far the most fun. We sat on hay bales and compared different half-pints from a cider called “Green Wonder” to a strong porter enticingly named “Chocolate Frog”, all while being serenaded by a decent trad folk band. It was heaven. I decided to go back this year, even though I knew it would make me miss my American friends even more. I’d been to the Great British Beer Festival in Earl’s Court and found it really overwhelming. Clearly I needed something like the cozy limits of the village festival to really train up to something as massive and overwhelming as the GBBF. I noticed that there were actually women drinking beer here, though only a handful. Most were drinking white wine, cocktails or abstaining while watching their children as the men drank. I did bond with another woman beer drinker in front of the gents as we guarded the door for each other. We compared notes scrawled on our line-up fliers provided at the door. She said, “I’m a Guinness drinker so I’m starting dark and working my way backward.” I loved her for that– breaking the rules! We both regretted that there was no Chocolate Frog– a velvety, seductive porter with a high alcohol content. She convinced me to try Fruit Bat which turned out to be my favourite of the day. I steered her away from Dark Star’s Espresso- a bitter stout which was a bit too ash-scented for me– something I love in a whisky but don’t want in a stout. Ironically when I went outside to listen to the trad band again, the singer was warning people off the Espresso– “It should come with a warning label!” So I’m not alone. I was drinking the Wickwar Severn Bore– an oakmoss nose, bog-standard tea at the middle. It was malty but forgettable, my least favourite of the day. I was drinking it while someone was smoking a cigarette next to me when the band shouted out to Boris, the new conservative mayor of London– GO TORIES– which definitely killed my buzz. Later they dialed down the controversy and shouted, “WHO’S IN FAVOUR OF WIND FARMS?” before playing “Drunken Sailor” – a song my mother used to sing to me as a baby. Sea shanties as lullabies– no wonder I turned out the way I did. While waiting for the next pint, a gent next to me with the wild grey curls indicative of rural English freakdom, notices the strongest ale, Highland Fling, is all gone. He says to me, “The greedy drinkers start backwards knowing us sensible lot start lighter. Don’t worry–” he winked conspiratorially, “We’ll last longer.” Beer flirting! By this time it was quite a scene. People were getting happily drunk and silly, talking to strangers and dancing around. I started to note the tee shirts about– WHAT DO YOU THINK OF MY DRINKING? CALL xxxx; GLASTONBURY 2007; BENCH; WARNING: CONTAINS NUTS; CROUCHING FAIRY, HIDDEN HOMO and one, worn by an a spreadsheet wielding American: SAVE THE ALES. Her loud, punning husband paired a “MIND THE GAP” trucker cap with the conversation-starter– WHAT WOULD JESUS BREW? stamped across his shirt. How is it I can come across an ocean, trekking far from the city to a community centre of a little village and I still find myself next to a loud, Christian, American nutter? He was spewing something about “YOUR PRIME MINISTER TONY BLAIR THINKS HE CAN SCAN MY LAPTOP, SO I BUILT MY OWN.” Someone next to me dealt with this man in the most sensible way, telling his teenage son, “Just don’t look directly at him.” Someone across from us asked him, “Well, what would Jesus brew?” and the guy started actually going off about mead in the Bible. Meanwhile a Mod cover band called Carnaby Street warmed up, starting their set with the Monkee’s Stepping Stone, and everyone knew the words. Pretty soon the Americans had made tracks and I was left with everyone else, dancing on tables, pounding on chairbacks and singing along. While I was angsting out about my fellow countrymen a party had started. 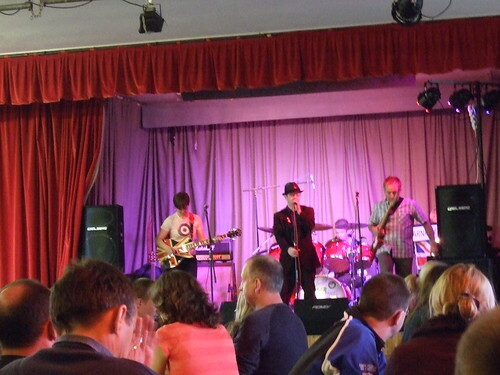 I got myself another pint as the band started up Small Faces’ Itchycoo Park which really brought the house down in this gentle, whacky way. It’s all too beautiful— a drunkards dream if there ever was one. I thought, yeah, believe it or not, I’m home. I started with Joseph Holt Mild, it being CAMRA’S month of milds. It was hoppier than expected. I prefer Harvey’s mild– I’m really after malty-toasty ease in a mild and the hops can go hang. Still, easy to drink as I meditated on the choices and made a numbered game plan. After breaking for a dinner of packaged salad, I tried the Bath Ale Barnstormer. I’m a fan of Bath Ales– and this one did not disappoint. It was dark caramel in colour with a fruit nose and biscuity front. I was drunk at this point and was losing patience with my note taking. It did taste just right after the garlicky edamame salad. Bearass from Beartown. Ask for it by name. The whole name. I had a blast of synesthesia tasting this– this was an American beer (though it wasn’t). It might be something cooked up by a friend in Portland or Los Angeles–a berry nose, a malt-hop one/two punch, with a clean, slightly bitter finish. It was zesty and daring and made me a bit homesick. Buffy Bitter— again I tried it for the name being a big Buffy fan. I took to this beer big-time. Cut grass nose– Canalside grass in August when all the berry briars are ripe with fruit! That kind of nose. The malt was straightforward and sweet, with delicate floral hops on the finish. I could drink it all day. Castle Rock Harvest was made with American hops. The soapy nose put me off but the front– dandelions and daisies– with a citrus-rind finish won me over. I got the second to last half pint of Fruit Bat— it was my lucky day. It had a beautiful amber colour and a wild, blooming fruit nose, with berries and mango and melon up front, but without the sweetness. — the hops closed it off nicely. I was wishing I had some strong hard cheese with this one. Anyone who doesn’t think beer is as complex as wine should try this. Mr. Chubbs Lunchtime Bitter from West Berkshire. I also tried this one for the name. Mr. Chubbs lives in a cottage with a fusty carpet you can smell it in the beer! This beer is lightly-hopped nostalgia– like drinking ale at grandpa’s place as he opens you a tin of beans. White pepper finish was the only flourish here. There’s definitely a “liquid bread” thing going on albeit a buttered, crustless white slice. Old English Rose— Queen Estery! This was a startling beer in that it was redolent of red roses and tasted just barely of the same. When I ordered the Palmer’s Tally Ho, which is named after a fox-hunting cry, the guy pouring had to note the colour. “It’s beautiful! Like a squash,” an English fruit punch. We both stared at the pretty red color, sharing a beer geek moment. My notes a were a drunken scrawl at this point– something about melon and wood and the lipstick on my glass being the same colour and keelhaul the man until he’s sober, early in the morning! but hey, this fox is still drinking!